#1. Do They Offer Insurance or Payment Plans? When searching for a dentist, it’s important to find one that is quality and affordable. See if they accept your insurance or provide payment plans or alternative options for those without it. This will allow you to receive the care that you need without spending more out of pocket than you have to. #2. Is the Dentist a Member of Any Professional Organizations? Check to see if your new potential dentist is a member of any professional organizations. Being a member of the Academy of General Dentistry is one thing, but if they have membership in more specialized organizations like the American Academy of Sleep Medicine or the American Academy of Oralfacial Pain you know that they’re passionate about their trade. #3. Where is the Office Located? Of course, what’s a great dentist without a good location? Make sure that your new potential dentist is located centrally to your home, work, or even consider the location of your child’s school. With your busy schedule, it’s important to find a practice that is easy to get to. #4. Does Your Doctor Participate in Continuing Education Courses? Continuing education courses keep dentists up-to-date on the latest and greatest in dentistry. If the dentist that you’re researching participates in continuing education courses, you’ve found a highly-trained expert who is willing to go the extra mile to progress and improve their practice. #5. Are Treatment Plans Discussed Honestly and Up Front? When searching for a practice, you’ll want a friendly and honest team. Does your potential dentist discuss their treatment plans in detail to justify cost? Will they let you know how long various treatments will take? This is something to consider when choosing a new dentist. #6. Do You Like the Office Environment? Before fully committing, visit the office to see if you like the environment. 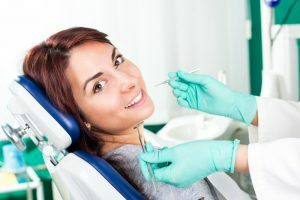 If you’re in the practice feeling comfortable and at home, then you’ve found the right dentist. You can also take your kids to see if they would feel relaxed at the practice. Now that you know these expert tips, you can find the best dentist for you and your family. That means quality, consistent, and convenient care for years to come. Dr. Renee Corbitt is an experienced dentist who enjoys treating patients of all ages. She is a member of a wide-range of professional organizations and her practice is conveniently located across from Hulen Mall. For any questions, she can be contacted through her website or by phone at (817) 294-8821.